If you happen to be new here, Toot is what we call our grand daughter, Lorelei. Not sure how we got started with it, but it is one of many names we call her. Anyway, this is just a little simple dress...I got the pattern from this post at another blog. As usual, I did not follow directions exactly. It called for double fold bias binding around the sleeves. I didn't have any so I 'lined' it .....just enough to cover the neck and armholes. I like that better than I would have bias binding anyway. I should have decorated the front a little bit, but all the time I was making it I was wondering if it will fit her...I think it will after seeing her this weekend. But I had it all made except for making the ties and a couple other little items...I had it the hem turned up and ready to sew down....and I needed to get the piece of elastic in the front and back. I am so tired--I have stood down in the basement playing with acrylic paints and muslin fabric. I tell you I don't have one ounce of talent with a paint brush. I don't know if I played around enough if I would gain any talent or if it would always be just a gloppy mess. I would really like to play like this often for a while to see if I would ever get more comfortable. This is early posting for me, but going to post this because I have other things to do, and later on I want to watch Mountain Men on the History Channel. So have a fun evening everyone...when I finally get to set down for the evening I will be around to visit everyone. What a pretty dress. I am sure that Toots will love it! That is a very pretty wee sundress and I think Lorelei willlook lovely in it. I have no artistic talent at all but I would love to be able to paint. I think the more you do it the better you would become. I just wouldn't know where to start :) Have fun with it!! 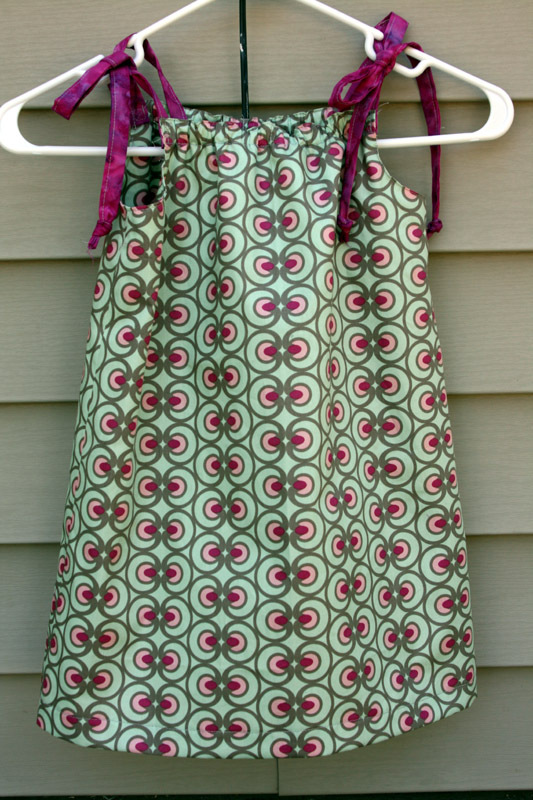 Sweet little sundress! And thanks for the link to the website. I just might one too! Lily won't wear anything but a dress so I should check that link out. Yours is very pretty Rose! What are you trying to make with the muslin and paint? This is just adorable, I love both style and color! I do not know any little girls whose favorite colors are not pink or purple! And when she comes, maybe you would even show us a picture of her wearing it!! Such a cute dress, Rose. I'm back after 10 days in Alaska, so am trying to catch up with blogging. Your little dress is really cute. Need to see some pics with it on Lorelei! The dress looks good to me. When does she get it? Very cute! I love the fabric and colors. Have you ever tried fabric markers? I bought some to use in VBS last year and have been meaning to try them on some fabric here at home. I think I would do better with markers than with brushes and paint. I used to paint on T-shirts but haven't done that for awhile. A really sweet little dress. Love the colors! Sweet sundress, which I'm sure Lorelei will LOVE! How darling, she's gonna look cute in it!